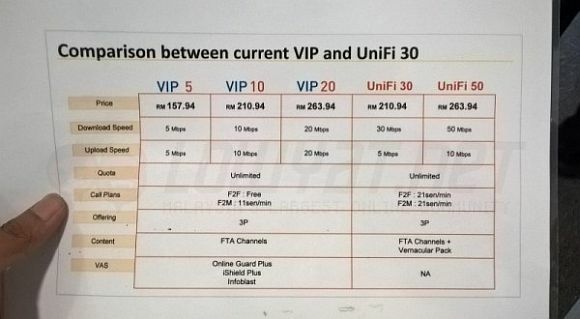 Ever since TM had launched its Unifi High Speed Broadband service 5 years ago, nothing much has changed when it comes to their Home broadband plans. Just recently we had a glimpse of its faster 30Mbps and 50Mbps options but they are limited to selected test areas within the Klang Valley. You could get 50Mbps for only RM263.94/month (inclusive of GST) which is the same price as their current VIP 20 plan with 20Mbps connectivity. The folks at Lowyat had just confirmed that the new plans are now officially available in all Unifi service areas. So now you can enjoy 30Mbps speeds at RM210.94 a month, which is the same price as their current 10Mbps plan. While it sounds good, there are some differences you should know before making the switch. TM’s current VIP Home Plans – VIP 5, VIP 10 and VIP 20 are having symmetrical bandwidth where you get the same upload speeds as your download speeds. So if you signed up for VIP 10, you get 10Mbps speeds for both download and uploads. For the new 30Mbps and 50Mbps plans, the speeds are asymmetrical where its upload speeds are much slower than downloads. The new 30Mbps plan gets just 5Mbps for upload while its 50Mbps plan settles for 10Mbps. Is this a big deal? It all depends on your usage. For normal web browsing, video and music streaming, 30Mbps for download is a significant jump from 10Mbps and the lower upload speeds shouldn’t be much of an issue. However if you upload a lot content especially Full HD or 4K videos, the 5Mbps upload speed would be a bottleneck. It will be the same story as well if plan on uploading huge files or doing video broadcast from your home. Despite a dip in upload speeds, the new Unifi plans are still offering unlimited quota until further notice. Another big difference is the lack of free landline phone calls. For the current VIP plans, each subscriber can make unlimited phone calls for free to any TM fixed line nationwide. Meanwhile phone calls to mobile numbers are charged at 11sen/minute, which is quite reasonable. On the new 30Mbps/50Mbps plan, there are no free calls included and all calls will be charged at 21sen/minute for both domestic fixed lines and mobile numbers. If someone in your household is making a lot of phone calls especially to land lines, you can top up additional RM21.20/month for its voice pack that gives you 600 minutes of voice calls to any local number. After finishing your 600 minutes, you can still make unlimited phone calls to any fixed line for free, while extra calls to mobile numbers are charged at 11 sen/minute. By default, all Unifi subscribers get HyppTV with a couple of free channels bundled in. On the newer 30Mbps/50Mbps plans, you get the extra option of either HyppTV Aneka, Varnam or Ruby Packs, which is about 9-12 extra channels depending on your choice. Which plan should you take? It all depend on your usage. If symmetrical connectivity with higher upload speed and unlimited phone calls are critical, the existing VIP plans would be your preferred option. If 5Mbps upload is sufficient and download speeds are more important, the newer plans offer faster download speeds for less. Essentially the new plans give you more than 2X the download speed but it cuts down your uploads by half for the same monthly subscription. Phone calls to fixed lines are now chargeable on the new plans but you can top up extra RM21.20 each month for the same option as before. To balance the lack of phone calls would be the additional HyppTV channels that you’ll get at no extra charge. The new plans are available and you can sign up at your nearest TM Point outlet. However do note that existing subscribers will be tied to a fresh 2 year contract when you make the switch. So if you’re on TM’s VIP 10 and VIP 20 plans, would you switch to these newer option? Let us know in the comments below.